I’m sure you’ve heard that old adage “Every cloud has a silver lining.” — a metaphor implying good things often accompany bad things. Many clouds do indeed display silver linings. There’s a nice shot of one back in my Aug 1, 2010 post. Today I bring you an image captured just last week. There was a lone cloud formed over Lake Pleasant (which is just on the other side of that mountain range). And that cloud shows a beautiful gold lining. If you read my post on silver linings, you know the color of the lining depends on where the Sun is relative to the cloud. At this point, the Sun hadn’t really set below the horizon. 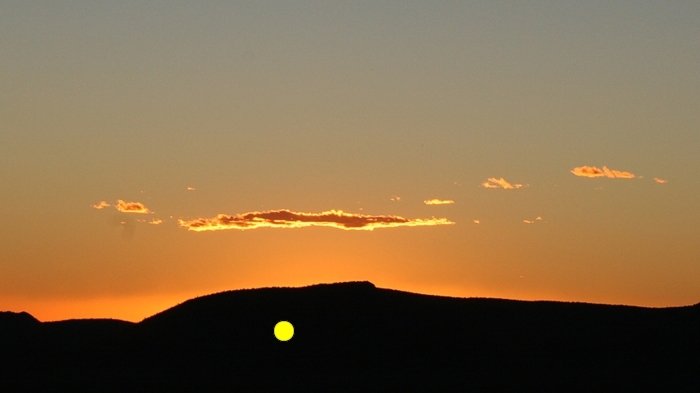 It was hidden behind that mountain at approximately the location of the yellow dot. There was still a lot of yellow-gold light in the air, and that’s where the beautiful gold lining came from. Now take a look at the image below. It’s the same photo, but wide-angle and uncropped. You’ll see there’s another cloud to the north (right) that shows a distinctively red lining. Light from the Sun has to travel a greater distance through the atmosphere to reach that cloud, so the light illuminating it has been reddened by Raleigh scattering. Clouds on the other side of the sky, in the east at sunset, won’t ever show linings, so in that sense the adage is false. They might show some colors, but you need to have the Sun behind a cloud for a lining of any color to form. Well … that’s not totally true. 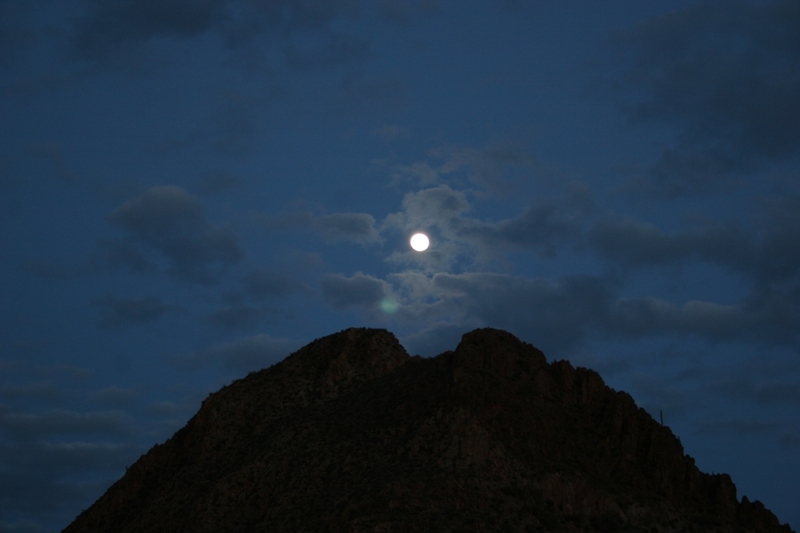 On several occasions, when a Full Moon was rising into a cloudy sky, I’ve seen silver linings. The Moon isn’t nearly as bright as the Sun (magnitude -12.7 vs. -26.7 = brightness ratio 1 to 398,110). But with the night sky darker than daytime, the contrast improves and you can get some nice lining displays. See this image search. It’s difficult to get good photos like that. Either the Moon is overexposed, or the clouds underexposed. You really need two photos of the same scene, taken at different exposures, and then combined digitally using a graphics editing app. Though I’ve never tried to assemble such an image, I got some of that effect on this moonrise over Gavilan Peak (a mountain just east of me). Click on the thumbnail to enlarge. 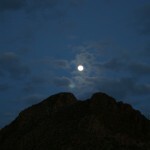 The Moon was rising through the saddle between the two peaks, nearly perfectly aligned. An internal lens reflection of the over-exposed Moon is also visible. Reflections like that are difficult to avoid when you have a single bright object in an otherwise dark composition. But at least you can see some distinct silver linings.